The 4x Suction PoolCleaner™ uses your existing pump and filter for power. This cleanes plugs into either your designated suction port or the skimmer. The 4x is suited for larger pools. This cleaner is intended for DARK BOTTOM POOLS Only. The 4x Suction POOLCLEANER™ has an internal programmed steering system, that causes the left wheel to periodically reverse, allowing the POOLCLEANER™ to turn and then move into another direction. For the 4x Suction POOLCLEANER™ there are three different programmed turns ranging from 90 to 540 degrees. This feature allows the POOLCLEANER™ to cover not only the deep end, but also the shallow end. The POOLCLEANER™ has no problem with uneven surfaces or strange shapes. It won’t stick in a corner, or get hung up by a main drain. 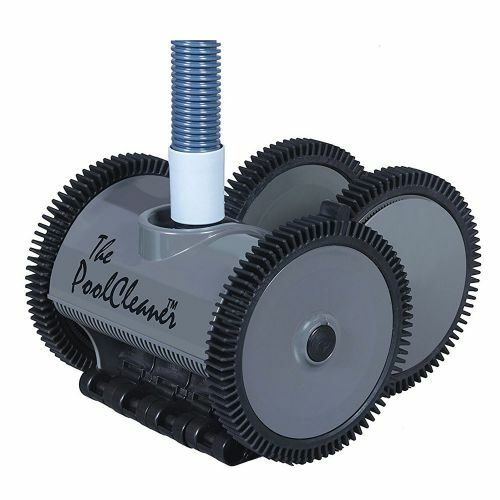 The POOLCLEANER™ has patented adjustable skirts that allow the cleaner to maintain optimal suction under the machine even when it encounters obstacles. When the POOLCLEANER™ encounters an obstacle one (or more) of the skirts will lift up (adjust) over the obstacle while maintaining suction under the cleaner.